As daylight disappears and temperatures drop, you may be tempted to re-locate your fitness routine indoors, if not abandon it altogether. But UW Health at The American Center fitness supervisor Kate Hemesath says winter’s approach doesn’t mean you have to sacrifice outdoor exercise for the drudgery of treadmills and indoor running tracks. Some may protest that winter air is a little too fresh. But Kate insists that one of the main drawbacks to exercising outdoors in the winter can be overcome with proper wardrobe planning, which mitigates the risk of hypothermia and frostbite. Year-round runners have to deal with extra perils in the winter – darkness and slippery footing. To make sure motorists see you on your run, Hemesath recommends reflective gear. A lot of running shoes have built-in reflective elements, and you can almost adorn your entire body with something that makes you stand out in the dark. “Specialty running stores have lights you can wear, reflective bracelets, anklets, belts and vests,” Hemesath. A quick perusal of Amazon.com reveals LED shoelaces, which, in addition to enhancing your running safety, have the advantage of being really cool. Hemesath says trail running in parks can reduce the impact on runners’ joints, but she favors on trail shoes when she runs outside in the snow, even if she’s doing so on the streets. “Trail running shoes have an aggressive tread on the bottom, so you're less likely to slip,” she says. Non-runners in winter climates have plenty of outdoor options, as well. 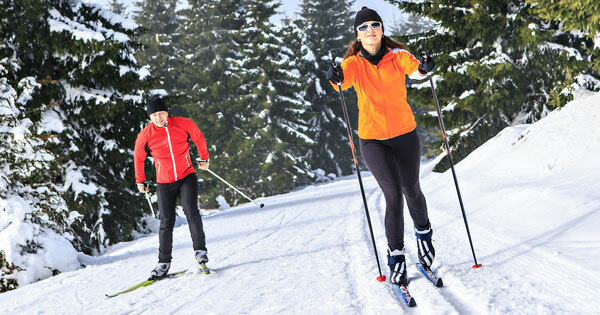 Hemesath is a fan of cross-country skiing for its cardiovascular and strength-building benefits, and also because it’s one of the more affordable activities in an increasingly pricey winter exercise landscape. “A lot of winter sports can be expensive,” she says. “Cross-country skiing can be done on local trails,” which are often free or relatively cheap, as opposed to the $50 or $100 lift tickets you’ll need to access downhill skiing trails (to say nothing about the costs of buying or renting equipment). Whatever your winter activity, Kate cautions against letting the colder temperatures convince you to neglect proper hydration. “The air is colder and dryer, so you don't sweat as much, but that doesn't mean you don't have to stay hydrated,” she says, adding that you should plan on drinking as much water during cold-weather activities as you would when working out in the summer. Where can I cross-country ski in Madison? Elver Park is open during the week and on weekends and has groomed trails rated as easy, intermediate and advanced. Its west trails are lit for night skiing. Odana Hills Golf Course is great for beginners, with groomed trails rated as easy open during weekend days starting at 8:30am. Yahara Hills Golf Course has easy and intermediate groomed trails for weekend skiers.